In King's Cross, for the second year running, we co-hosted an Argent-led Joint Work Experience programme with many of the local organisations on the new development, including BAM, Tileyard Studios, Urbanest and KCES. The students, this time from Year 10 in Camden's Haverstock School, excelled everyone's expectations with their maturity and level of engagement. Their reflective presentations were fire! Inspired by this joint work experience model, we ran a similar programme at our Canada Water home, the Paper Garden. 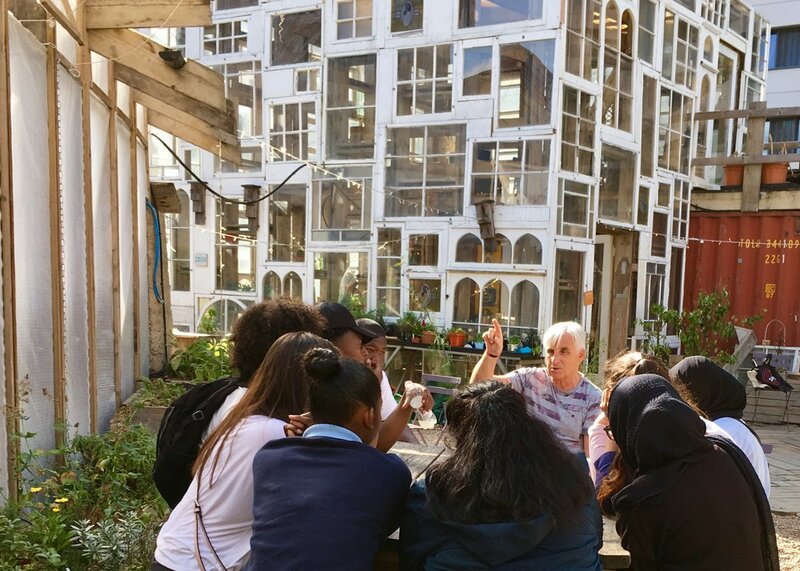 We hosted pupils from new partner schools in Southwark, in partnership with Allies & Morrison, AKT II and Townshend Landscape Architects. We were also delighted to launch this year's summer work experience programme with our stalwart supporters Eurostar - now in its fifth year - providing week-long placements for young people within the business, enabling them to get a sense of its operations and different roles across its sites, including a visit to France! Peter McDonough of Urban Partners and Ted Baker provided a really valuable insight into the working world both within Ted Baker as well as in the wider local labour market in general. "My experience at the Skip Garden was very good and also different to anything else I have done before. For example, when I help out at my dance school to teach the younger classes it is a different setting, and I have gotten used to it. While at the Skip Garden, I had to interact with different people and it was good to get a little glimpse of what the world of work is like." "This work experience made me question why so many people in the world don't bother to take more action and attention into saving the environment like the Skip Garden is working towards. It has also made me realise that jobs where you can do what you love do exist." "I noticed that for the other people in Global Generation, the work was something they all enjoyed doing, meaning that while others find work for the money the people here seem to actually love what they do for a living." "I enjoyed doing more hands-on activities than sitting around, and that I realised I am good at communicating with people even though I don't know them at all." "I gained more independence from this experience because while I was here I had to make descisions of my own." "If I was to give someone who wanted to do this work experience advice I would tell them to be open-minded at different possibilities and not be afraid to try new things." "It was kind of weird for me starting because I seemed to be the only boy out of all the staff and I felt a little out of place, however, I think I settled in comfortably in the few days and I learned that I can talk to many different people easily." "I learnt how to work with other people I’ve never met before more comfortably and how to be more confident when talking to various people." "I dealt with challenges by just not thinking about them and did whatever work I needed to. I learnt that I can deal with challenges easily; when we were preparing the room for the photography exhibition there was a problem and I managed to think of a way around it quickly and it worked so I realised I’m a quick thinker that can respond to problems easier than I thought. I also thought I might get chased by evil bees or butterflies in the garden - that hasn’t been a problem!" "I noticed that I’m more creative than I thought, especially when I was helping to set up for the exhibition. I also think I learnt a bit more about nature, food and how eating organic food or growing plants is good for wildlife and the environment. I found out I’m a better cook and I’m quicker at doing things than I thought. I also realised that I prefer to be outside than inside and that I prefer to do more practical things instead of writing things down and doing work on paper." "I wondered why the food they serve in the cafe is only vegetarian and it made me think about why people don’t do more to prevent climate change and why people don’t do more to protect plants and nature." "It's made me think about Catering/Events management as a career; speaking to different people made me realise if I work hard now it will pay off when I’m older and I’ll have a good career if I have an interest in it." "I would tell someone else who was considering doing this work experience to do the best they can because they only have one opportunity to do it and they might learn things they didn’t know before - just be open to whatever is asked."